Product prices and availability are accurate as of 2019-03-27 14:52:21 EDT and are subject to change. Any price and availability information displayed on http://www.amazon.com/ at the time of purchase will apply to the purchase of this product. Main Features: LCD Display, Digital Control & Digital Pressure Gauge, Dual Motors & Double Stages, Built in Turbo Fan & High Pressure Compressor; Input: DC12V / 40A / Max Power Dissipation: 500W. Max 500L Air per Minute. Max Working Pressure: 60 Kps (8.5 PSI). Pressure Increments: Per 1Kpa / 0.15 PSI & Start from 1 PSI. Pump Auto Stop. Maximum Continuous Working Time: 30 Minutes Enter the maximum desired pressure by using the set pressure button. The pump provides readings in metric (KPa). (Pressure: 10KPa = 100mbr = 1.45 PSI). 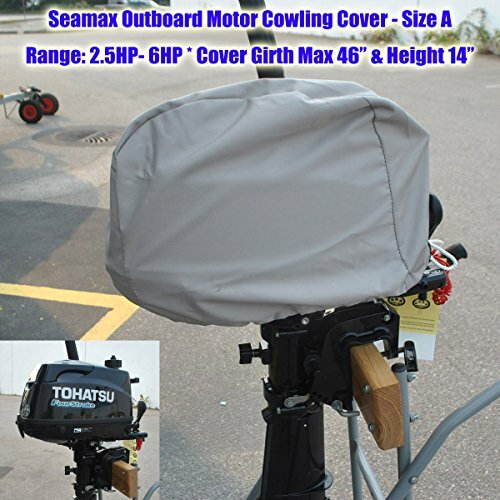 Default working pressure is set at 25KPa (3.6 PSI) for heavy duty inflatable boat. 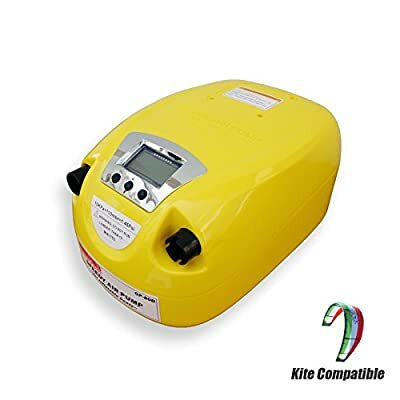 45Kpa / 6 PSI for inflatable kite. Press the POWER button to start. During inflation, the left hand side of LCD screen shows the pressure that the inflator has reached. 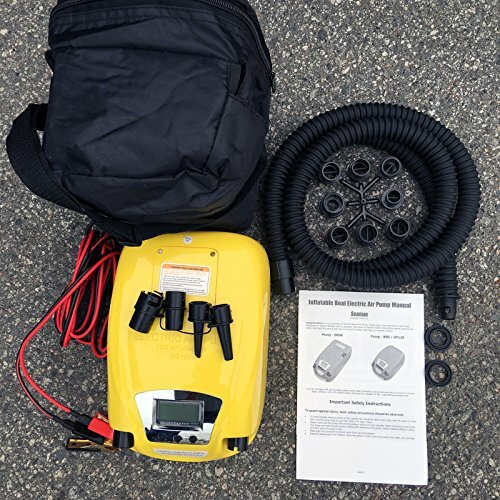 As soon as entered set pressure has been reached, the inflator turns off automatically. Take off the air hose from the chamber once the pump stops running. 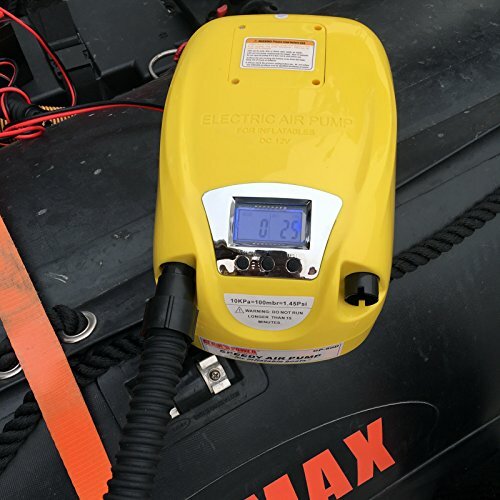 The inflator can be turned off manually at any time by pressing the POWER button. 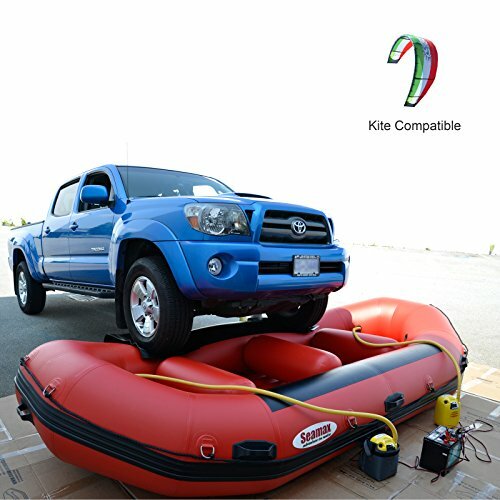 The pump is good for both inflatable boats and inflatable kites up to 6 PSI / 50 Kpa. 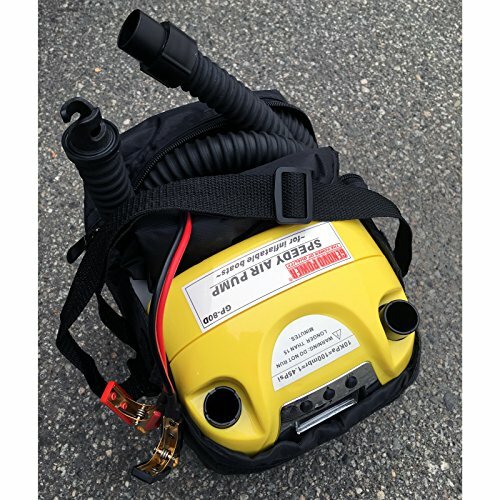 It comes with universal air valve adapters and Kite air valve adaptors.